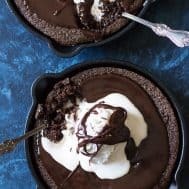 This easy Paleo Chocolate Skillet Cake is super fudgy alone, then topped with hot chocolate fudge and coconut ice cream for a dessert that you won’t believe is made with good-for-you ingredients! Gluten free, grain free, dairy free and kid friendly. Merry ALMOST CHRISTMAS everyone! And Happy Hanukkah, too. This is one of those years where Hanukkah and Christmas fall at the same time, and that makes a still-sort-of-confused-about-which-one-I-celebrate, not-particularly-observant-Jewish-girl like me very happy. It also happens to work out really well for my kids, since we were away in California for the past week for a very good friend’s wedding PLUS Disney, only to come home to double – or even triple presents. Hanukkah, (some) Christmas, and GRANDPARENTS. Grandparent presents are in a-whole-‘nother category of presents, don’t you think? There are no rules there. Plus, they just saw two sets of grandparents on our trip, so let’s just say they are going into the holidays already pretty spoiled. I am no grandma yet, but, because I love you guys (and I love chocolate – not gonna lie) I am here today on Christmas eve/ first night of Hanukkah, to spoil you all with this extraordinarily fudgy (even without the fudge topping!) 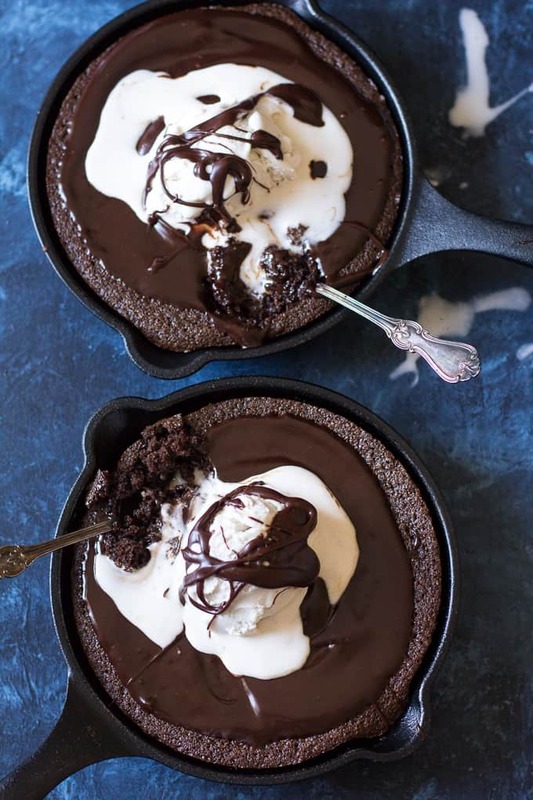 chocolate skillet cake. Because WE ALL DESERVE IT! Plus, I thought you might need an extra special, seriously easy dessert to make JUST BECAUSE. 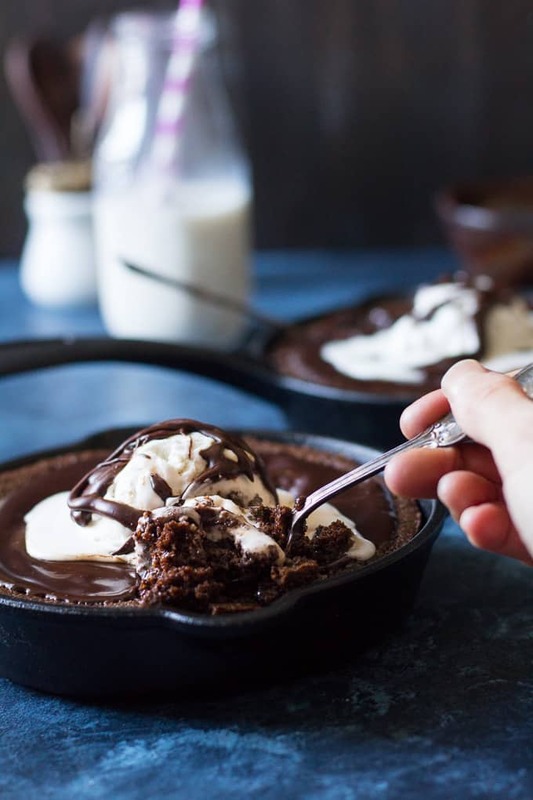 Even if you’re reading this in the future and there are no holidays in sight, trust me – this chocolate skillet cake is for you, and YES, it’s the right time to make it. I started with a fudgy, almost brownie like cake. Yes, it’s Paleo and it’s actually healthy but no, you can’t tell it is. 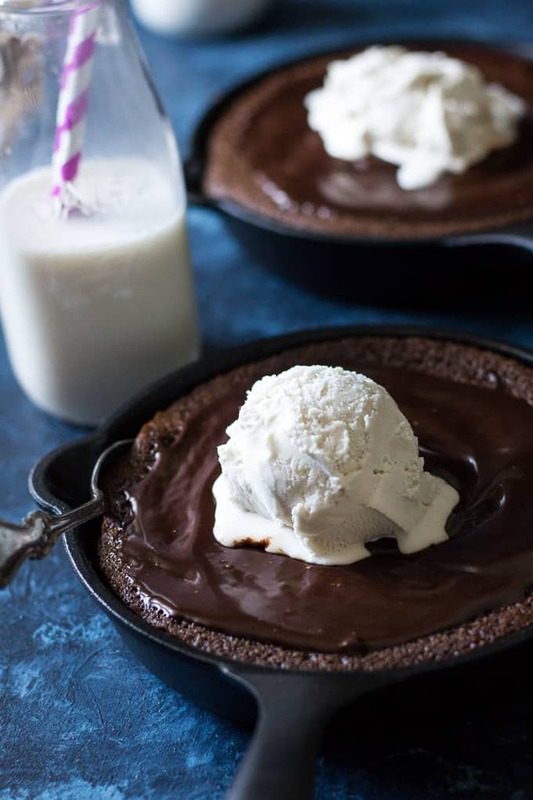 Because that wasn’t enough for me, I topped it right out of the oven with the easiest 2-ingredient hot fudge you could imagine. Then, because I’m an ice-cream-4-life kinda girl, I topped it with my favorite (as of recently) coconut vanilla ice cream. The link I provided to the ice cream is Amazon Fresh, but I buy it at my very local, not-fancy grocery store – where I actually buy 90% of the ingredients I use for my recipes. I love how times have changed! 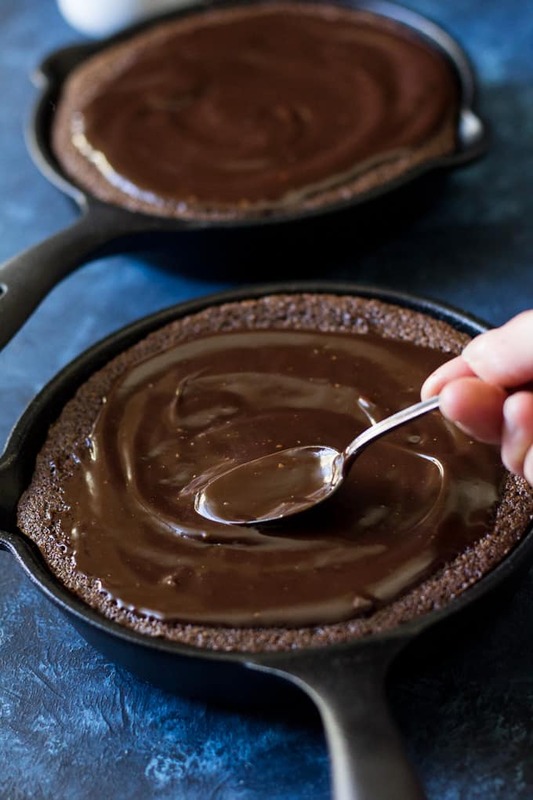 I decided to make this cake in my cute little 6.5″ cast iron skillets, but it will also work perfectly in a 10″ skillet or a 10″ cake pan if you don’t have the skillets. Baking time will vary anywhere from 20-30 minutes, so just keep your eye on the center to make sure it’s set. This happens to be an extremely forgiving recipe, so I have no doubt you’ll love it no matter what. The one caveat I have for this recipe is not to add the ice cream until you’re ready to serve/devour, since although it’s yummy, puddles of melted ice cream might not be the direction you want to go here. Okay, maybe I take that back – I don’t think there’s anything you can do here that you’ll regret – apart from eating the entire thing yourself. 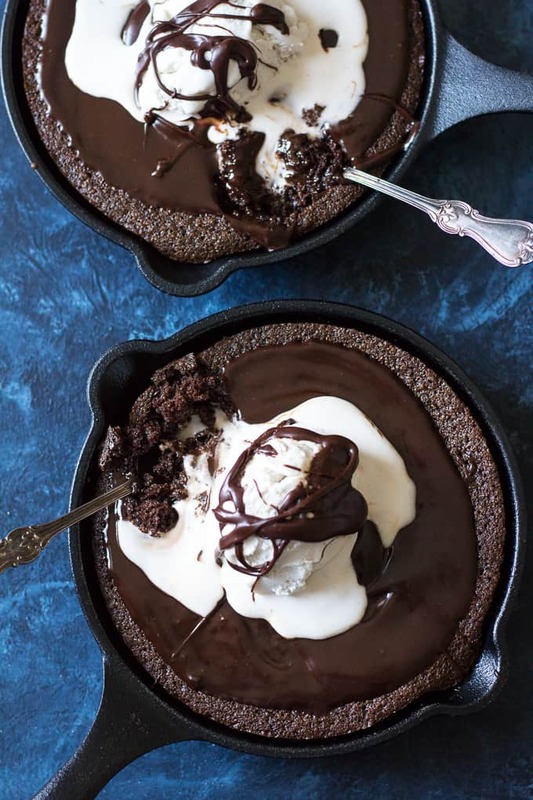 Since this cake is very fudgy, it’s not one to “slice” for serving, it’s more like a skillet sundae, if you will, as long as it’s served warm. If you refrigerate prior to serving, it will take on a firmer, brownie-like texture that’s great for slicing. You can always refrigerate and then gently reheat right in the skillet to get that melty, just-baked texture back. 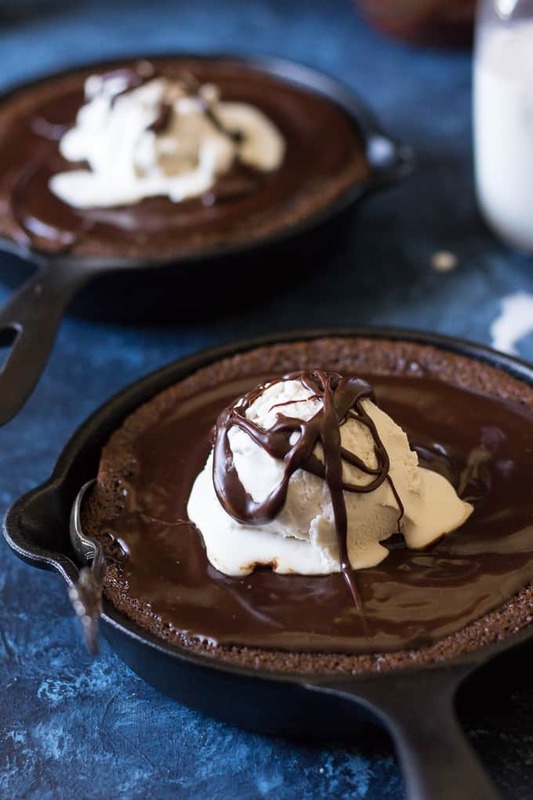 This easy Paleo Chocolate Skillet Cake is super fudgy alone, then topped with hot chocolate fudge and coconut ice cream for a dessert that you won't believe is made with good-for-you ingredients! Gluten free, grain free, dairy free and kid friendly. Grease one 10 inch or two 6.5 inch cast iron skillet(s) (or other oven proof skillet) lightly with coconut oil and preheat your oven to 350 degrees. In a large bowl, beat the eggs with a hand mixer (or whisk well by hand), then add the coconut sugar, vanilla extract and coconut oil and beat well. In a separate bowl, combine the almond flour, cocoa powder or cacao, baking soda and salt. Add the dry mixture to the wet and mix well until smooth. While the cake bakes, make the fudge topping. In a small saucepan over very low heat, combine the chocolate chips/morsels and coconut milk and melt, stirring, until smooth and shiny, then remove from heat. Allow the cake to cool in the skillets for about 5-10 minutes, then spread the fudge topping evenly over the cake(s). To serve, top with a scoop of coconut vanilla ice cream and more fudge topping if desired. Store leftovers in the refrigerator (without the ice cream) for up to 4 days. Enjoy! Want more easy and delicious Paleo Chocolate Desserts? Try one of these! 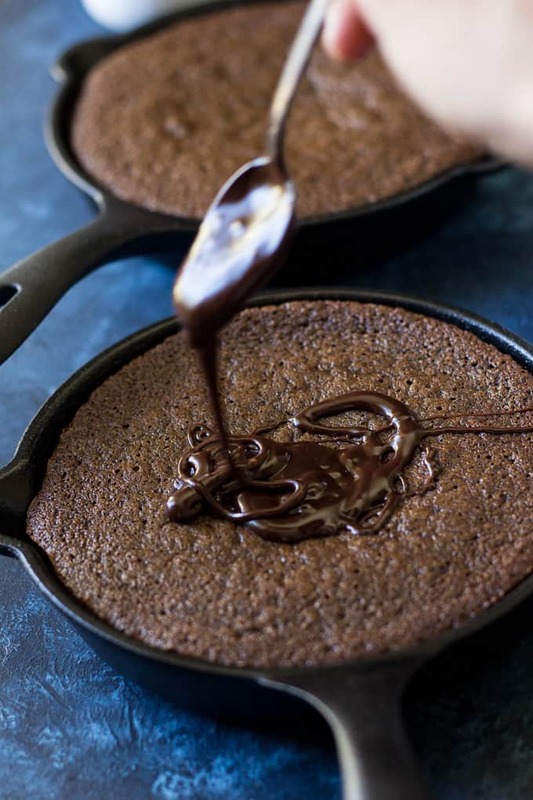 Do you ever bake in cast iron skillets? Where do you buy the majority of your groceries? This is amazing! I would have never thought to do something like this in a skillet! And the ingredients are something I can feel good about feeding my kids for an occasional treat – what a fun idea! Thank you! 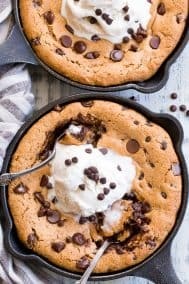 I definitely have a thing for eating anything right out of a skillet! This is a really fun indulgence, hope you try! looks divine!!!!! my dream dessert! Thanks! I love anything I can make in a skillet, lol! This looks like the most epic dessert ever! I love a good skillet cake. 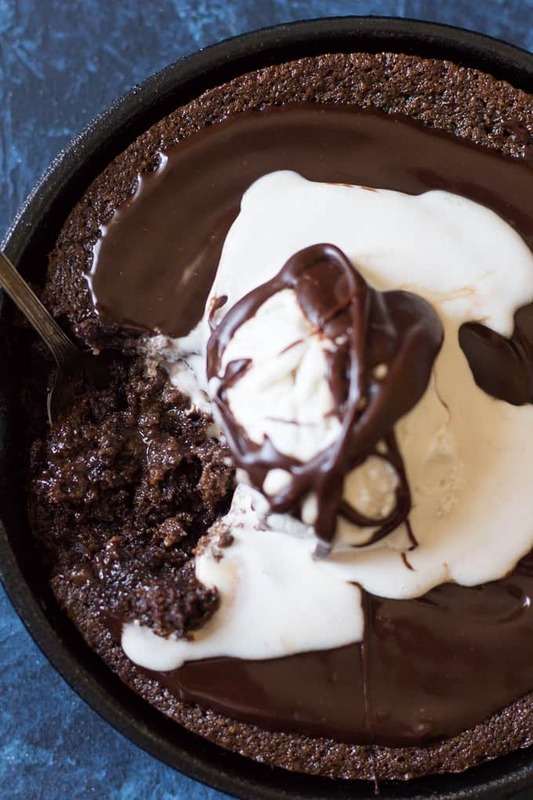 This Paleo chocolate skillet cake looks sinfully delicious ! I love chocolate and this says directly to me…EAT ME !! I’ve been on a big deadline this week and haven’t had much sleep or time to do anything besides work. I am totally CRAVING chocolate goodness like this! This looks unbelievable! This is an amazing recipe! I never knew it was quite so possible to fall in love with a recipe so quickly. Must.Make.Soon. Ph. Em. Gee. My jaw is on the floor! I know what I’ll be making right after my Whole 30 is done, for sure. Haha same here, this was a good one! Thanks! 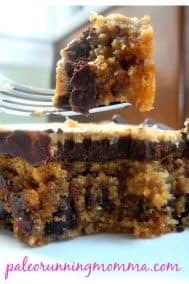 Is there a substitute for any the Coconut sugar? We can’t have ANY type of sugar in this house! The best easy chocolate cake I’ve had ever made. The chocolate sauce did not come out good but it because I used Lily chocolate chips which is stevia based. Best of all my hubby loved it. Goes great with Halos vanilla ice cream. Does the sweetener have to be granulated? Could honey be used? I think for this recipe it could work although honey burns faster so you might end up with a gooier cake that doesn’t need to cook as long. If you try it out I’d be curious! very delicious. i love that my children and i can have a treat thats pretty healthy. this recipe is a keeper! !… next time I’ll add dessicated coconut in the batter for added fibre and fullness. i didnt make the fudge, as the kids just had some cream on top. i prefer the cake on its own without topping. i had it with a cup of tea. it was lovely. thanks for the recipe Michele! This is sure to satisfy any sweet tooth. 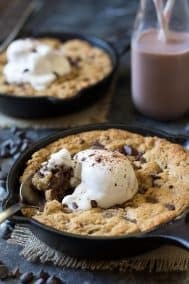 I made mine in a 10 in cast iron skillet and topped with Enjoy Life chocolate, homemade salted caramel ice cream made with coconut milk and drizzled with more melted Enjoy Life chocolate. This is very rich and very sweet but very good. I made this tonight and it was delicious. Your instructions are always so clear and precise- thank you! I did have one question- is the cake part of the recipe supposed to really dry and not like a regular cake batter? Mine was almost like a dry, pasty texture. Thanks! This is still my favorite treat… making it today for my birthday 🙂 Kids all love it as well- win win! Love your blog! Yay! Thrilled to hear that! Omg this is the best cake I ever had. It’s perfect amount of sweetness.